Talia Ilan is the Music Director of the Israel Stage Orchestra, Music Director of the Campus Symphony Orchestra, resident conductor of the Reflex Ensemble of contemporary music (New York and Tel Aviv), as well as conductor and co-founder of the Classical Women orchestra. As a long serving music director of two orchestras, Talia strives to bring the orchestras up to their highest standards as well as to nurture the connection between the orchestra and its community. 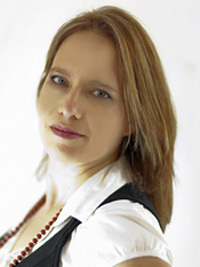 Talia made her debut with the Israel Philharmonic Orchestra in June 2017, and she has guest conducted in China with the Macao Orchestra and the Qingdao Symphony Orchestra, in Italy at the Ischia Music Festival, in New York with the Reflex Ensemble at the Symphony Space, and in the Czech Republic with both the Janáček Philharmonic, Ostrava and the Moravian Philharmonic, Olomouc. Talia is also serving as the conducting teacher at the Jonathan Wohl Music School, the Ono Academic College. My mother let me listen to classical music since I was born and by the time I was five I was playing LPs myself. Later, at the age of ten, I started playing the piano. At the age of 14, when I started high school, I went to the best school for arts and music in Israel, called the Thelma Yellin High School. We studied music literature and music theory. I realised that the music I really loved was orchestral music, more so than piano music. I continued to play the piano but I felt my real love was orchestral music and I realised that the person who makes this happen is the conductor. I forgot that I’m not a man. I didn’t pay attention to this ‘problem’ and I started educating myself to become a conductor because I was too young to study in university. From the age of 14 to after the age of military service, 21, I bought all the scores and I attended rehearsals of the Israel Philharmonic. I also visited London almost 50 times to attend concerts of the London Symphony Orchestra. The Barbican Centre was my second home and I studied there with Michael Tilson Thomas, who was their musical director at that time. After my military service I started to attend the Music Academy in Jerusalem so I could become a conductor. I took a first and second degree, as well as an artistic diploma in conducting, and this has been my profession ever since! 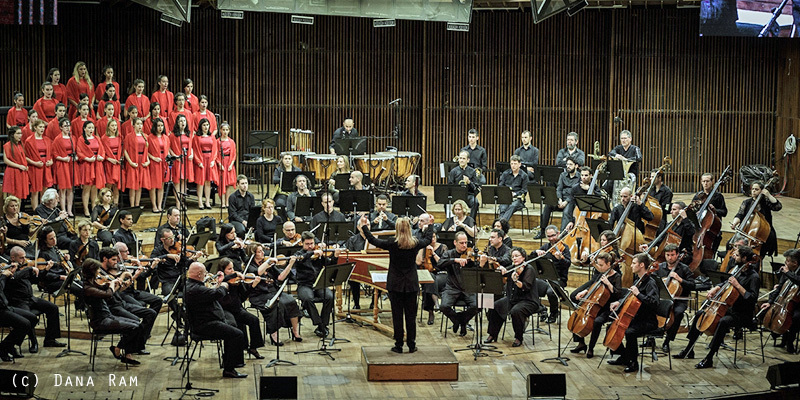 Right now, I am the Music Director and principal conductor of two orchestras in Israel. The first one is the Israel Stage Orchestra, which is a chamber professional orchestra which is supported by the government, which is one of only twelve orchestras in Israel that they fund. The other orchestra is the Campus Symphony Orchestra, a community orchestra. It has 60 musicians who come to play once a week and we stage five or six concerts per year. I’ve been working with these two orchestras for 17 years. I have a dual role because I’m Music Director and principal conductor. As a Music Director it’s mainly office-based work with government and people who are responsible for music education etc. In my role as conductor I’m responsible for choosing the repertoire, for rehearsing the orchestra, and, of course, conducting the concerts. The thing I enjoy most of all is rehearsing with the orchestra, even more so than the concert itself, because in the rehearsal it’s the process of making the music sound as I believe the composer wanted it to sound. Of course, the concert depends on how I’ve prepared with the orchestra, but it’s when we’re rehearsing that I can be free and try new things. The process of rehearsal is much more challenging than conducting a concert and for me, those rehearsals are the best part of my job. Conducting is male dominated because in history, most professions were male dominated, so the idea of gender balance is something new to us, but eventually as we progress in making life more equal and we break down gender bias things will change. There are many obstacles for women to enter this part of the arts. Today there are more women attending school and university in Israel, but the problem comes when they want to find a job. Music directors often don’t want competition from conductors who they perceive to be as good as, or better than them, female or male. I believe most of women who are coming into this field are more determined and talented than the average, or they wouldn’t have the courage and tenacity to enter the profession, but they have a challenging time when they join. There are some things which haven’t changed or have only been changed a little over time, so more progress needs to be made. For example, when I was a conducting student I was the only woman, and twenty years before me there hadn’t been a single woman studying conducting. When I took some masterclasses outside Israel, in America for example, I met other female conductors for the first time in my life. It made me feel so much better to realise that I wasn’t the only one, as I had been in Israel. Only ten years after I was studying there started to be more female conductors. I am proud to have been able to act as a role model for them and hopefully to have opened doors to hopefully have made it easier for women to become conductors in Israel. Sharing stories helps because in my time there were very few stories of female conductors around the world, let alone in Israel. I’m sure today that there are many other countries that could be more open to increasing opportunities for women. Unfortunately, it’s still a very patriarchal society in Israel but I also see this in Europe, which is very conservative in many things. It seems to be less so in the parts of America I’ve visited. My advice to women and girls is that they have to keep going and to keep believing in themselves. They have to look for mentors who also believe in them and will try to help them break through so they can become the next role models for other female conductors. When I was studying in the 90s I had to be very strong to fight all the things that were against me. I had to believe in myself when no one else did, when there was no-one else who really cared or who wanted to help me. I had to be incredibly strong in order to believe that I could do it in the long run. 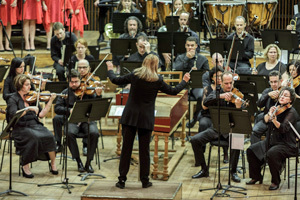 When we have more female conductors, society will have to accept it as it will be ‘natural’. 25 years ago, when I went for my audition at one of the other orchestras everyone was looking at me so strangely like I was an alien, because they’d never seen a female conductor. I thought my button was open or something as I didn’t understand at first why they looked at me like this! I got the audition and I continued working with them as I felt that the moment I started conducting they all forgot it was a woman on the podium. It was only difficult for them to accept it in the first place. 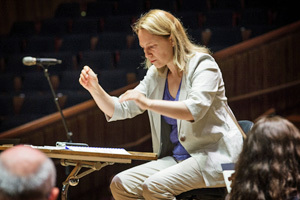 Today it’s something much more natural because female conductors, whilst in a minority, aren’t something unique, and this can only be a good thing. Next week I’m going to do two concerts with the Haifa Symphony performing an all-Beethoven programme, and then many more concerts with my two orchestras this year. I’m hoping I’ll have some invitations soon to conduct some concerts in Europe.